Not all health problems are visible, Transport For London’s new badges recognise this and are encouraging more people to give up their seats for people in need. If you travel by tube, you may well have seen the ‘baby on board’ badges pregnant women are able to wear, encouraging others to give up their seat if none are available. Many of us know to give up our seat if someone is pregnant, injured or using a walking aid – but what about disabilities and health problems we can’t see? 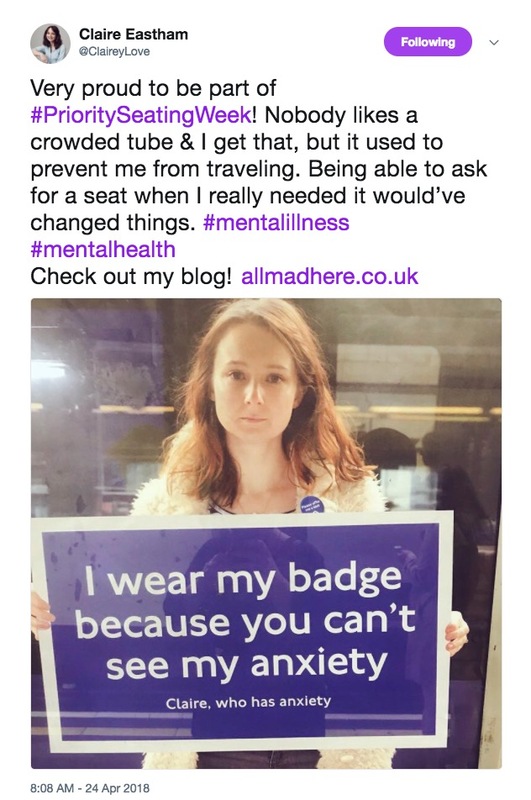 Last year TFL created the ‘please offer me a seat’ badge for those with hidden illnesses to wear when travelling by tube. Earlier this week to mark the first year anniversary of the badges (and to reinforce their important message), TFL launched ‘Priority Seating Week’. Pictures and stories of people with hidden illnesses have been shared to raise awareness of the badges and how they help those who wear them. People with health problems like epilepsy and vision impairment were included in the campaign, along with Claire Eastham, a mental health blogger and author of book “We’re all Mad Here” who discusses anxiety and its impact on her life. 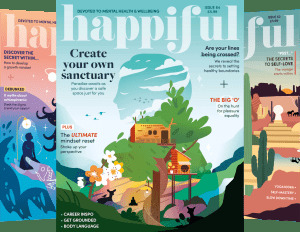 We’re thrilled to see mental health conditions represented in the priority seating campaign as we know how tough simple activities like travelling by tube can be for those struggling with their mental health. When feeling anxious, being able to sit down and have a little space can make all the difference. It allows you to focus on your breathing and encourage yourself to physically and mentally relax – something that can be very tricky when stood up in a crowded carriage. You can find out more about applying for a badge on the TFL website. We hope this is a sign of things to come – where both physical and mental health are considered as important as each other. We’ll be watching on and applaud TFL for taking this step.